Lois Lane has been on comic book pages, in novels, voiced in radio shows, in animated movies, and on TV and movie screens for more than 75 years. As one of the most iconic women in comics, plenty of fans recognize her -- but often only to remember that she’s Superman’s main squeeze. Lois has a lot more going for her besides the last son of Krypton falling in love with her, though. It does not matter whether it be in the comics or the movies, Lois is often the smartest person in the room. She is always looking beneath the surface to discover the truth. It’s her tenacious hunt for the truth that led her to journalism in the first place and often gets her into trouble. In fact, nearly every version of Lois Lane across DC Comics’ many universes has been involved in journalism somehow. If she’s not writing the top stories, she’s in front of the camera reporting them, selling the newspapers that they appear in, or running a multi-media company. As a result of her constant presence in the comics, Lois has become one of the most adapted DC comic book characters next to Batman and Superman. She’s appeared on radio, the Broadway stage, in movies and television programs, and in video games. With DC’s favorite investigative journalist returning to the big screen in Justice League, we’ve got the skinny for you with the 16 Things You Didn't Know About Lois Lane. During a surprising villainous turn, Lois Lane went up against Clark Kent’s mother -- and lost. Following the deaths of Lois, Clark, and numerous other big names in DC comics, they were “resurrected” as Black Lanterns for the “Blackest Night” arc. The Black Lanterns weren’t evil on their own, but instead were controlled thanks to their place in the land of the dead. As a Black Lantern, Lois kidnapped Martha Kent, and her only wish was for their entire family to be united in death. With that kind of wish, Lois, of course, attempted to kill Martha. 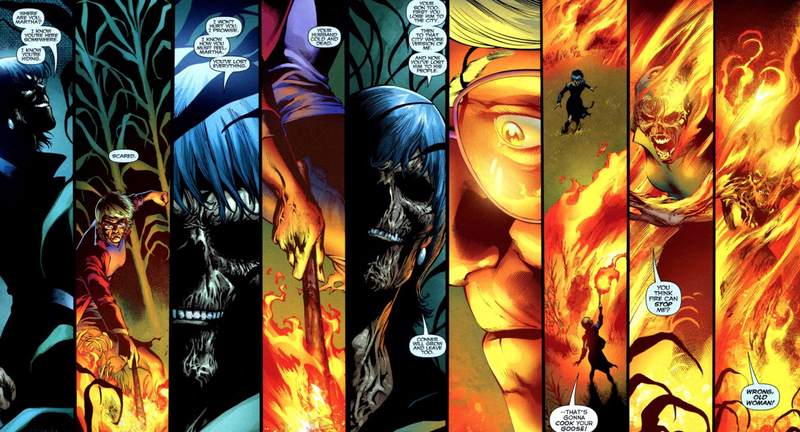 Martha was surprisingly resourceful and outwitted Lois, setting the undead woman on fire, though thanks to already being dead, Lois continued to regenerate until help arrived for Martha. 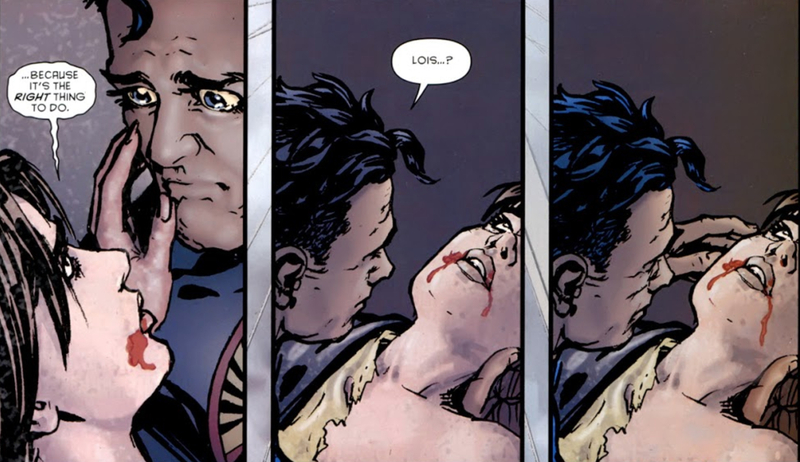 Lois eventually sacrificed her own Black Lantern status to allow her husband to be resurrected instead of her. The Flashpoint story arc in DC comics created a lot of changes to the world as readers knew it, but Lois was still the same tenacious and curious woman at her core. She was initially a reporter, but after stumbling into war, she became a member of the Resistance. Lois was actually covering a fashion show in Western Europe when the Atlanteans and the Amazons came into conflict. The Amazons saved all of the women who found themselves in the middle of an area being flooded by the Atlanteans, but in doing so, the women were expected to become members of New Themyscira society and work with the Amazons. After discovering that her photographer had been a member of the Resistance though, Lois decided to continue his work, reporting her findings to Cyborg and traveling across Europe gathering intelligence along the way. Eventually, she even broadcasts everything she knows on a radio transmission and is killed for her efforts, though she manages to inspire Kal-El to become Superman. Before marrying Clark Kent and being privvy to his Superman secrets, Lois dated another hero in the '80s. Jose Delgado was a man who hid his vigilante nature from Lois. With him constantly annoyed because Lois skipped out on their dates to cover a story or because she had an obvious attraction to Superman, you can’t really blame Lois for not noticing that he was the Gangbuster. The two had a relatively hot and cold relationship, and it definitely fizzled when Lois learned he accepted help from Lex Luthor’s corporation. Jose had suffered shattered legs during a fight with a cyborg, and after plenty of therapy, he accepted an experimental microchip from a subsidiary of Lexcorp so he could walk (and reclaim his vigilante life). Lois, who had reported on the corruption of Lexcorp for years, didn’t take the news very well. In the comic book multi-verse, there are many versions of Lois Lane who exist on other worlds. 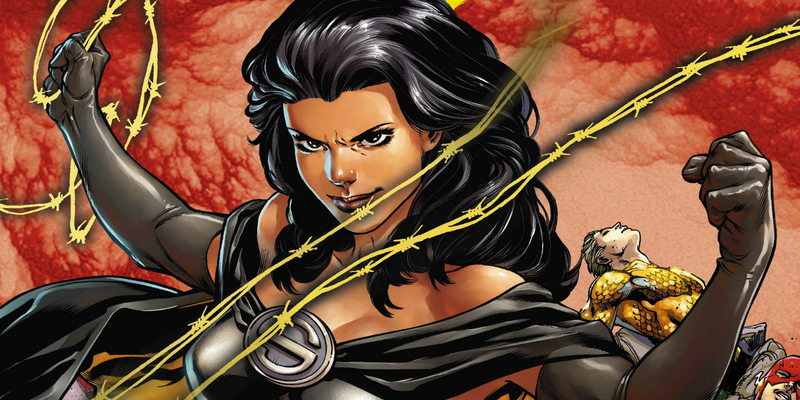 Outside of the main DC comic continuity, there’s a Lois Lane who is actually an Amazon. This particular version of Lois is from one of the comic book versions of Earth-3, and there, the Amazons aren’t a group of woman protecting the world -- mainly because Lois is the only one left. In order to prove herself the strongest amongst them, Lois systematically killed all of her people. Needless to say, she’s not exactly the hero of Earth-3. Instead, she’s a member of the Crime Syndicate who doesn’t have a particular sense of loyalty to anyone. All this Lois wants is power. She’s even gone so far as to attempt to conquer other Earths to get it! Lois Lane wasn’t simply dreamed up out of thin air by Jerry Siegel and Joe Shuster. There were four famous women who provided them with inspiration for the character. Nellie Bly (real name Elizabeth Cochran) was a pioneer in investigative journalism, starting to write for local papers when she was just 15 years old, and eventually going on to go undercover in mental institutions and taking a trip around the world (in less time than author Jules Verne’s characters). Her tenacity and skill inspired Lois’ career choice. Joanne Carter was a model who placed an ad in the paper looking for work. 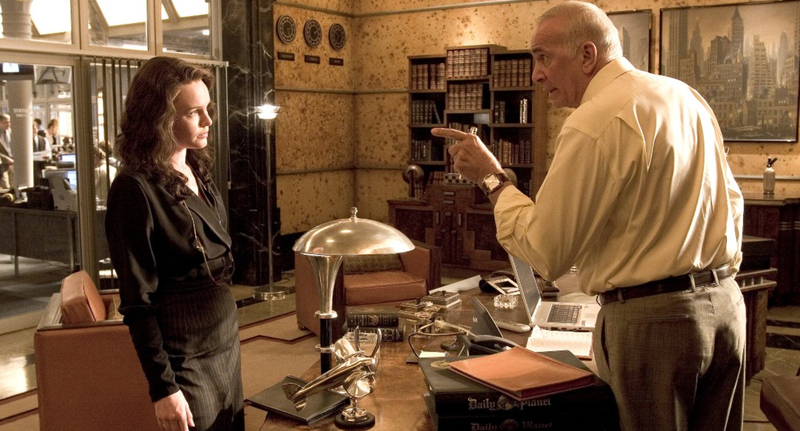 Superman creators Siegel and Shuster hired her to sit for them to assist in coming up with a look for Lois. Siegel later married her. Actresses Glenda Farrell and Lola Lane also provided inspiration. Farrell had been playing Torchy Blane “Girl Reporter,” providing the spark of an idea, while Lola Lane’s name was the inspiration for the one Lois would receive. Later, Lane also played Torchy Blane in one movie. Just like Torchy Blane getting the “Girl Reporter” title in the '30s, Lois Lane found herself with the moniker in a comic strip. She was so popular in the Action Comics stories alongside Clark Kent and Superman that she was given her own newspaper comic strip in the 1940s. The character got to have the spotlight away from Superman for a time as she caught bad guys and wrote stories unrelated to the hero that she attempted to “unmask” in the comic books. As time went on though, Lois became less independent and more focused on her relationship with Superman and Clark, especially in the 1950s. In the 1950s Lois did get to graduate to her own comic book called Superman’s Girl Friend Lois Lane. During the '60s, the comic was one of DC’s most popular titles, even becoming a top 10 best seller. 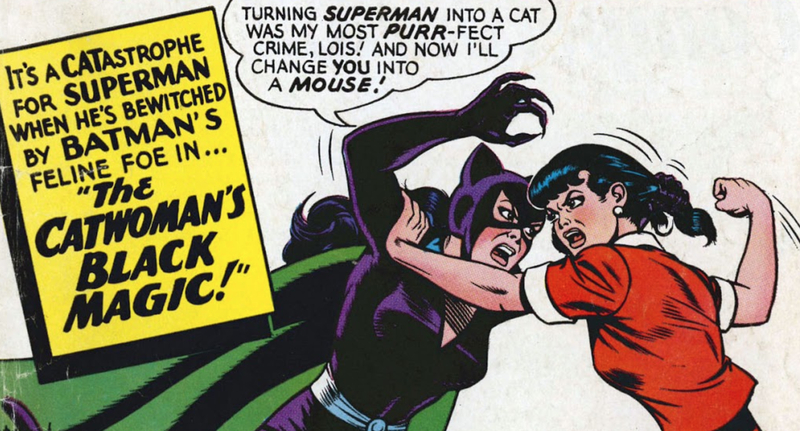 Catwoman spent a decade out of comics, but Superman’s Girl Friend Lois Lane brought her back to the page for the Silver Age in its issue #70, and Lois even got to don the costume. After hearing a news report that the Penguin had escaped prison, Clark went to the prison to investigate for a story, but Lois hit up a local bird sanctuary that was opening instead. Over the course of the story, Catwoman emerged on the scene instead of the Penguin, hypnotizing Lois into believing she was the villain herself. Catwoman’s plan was to have Lois kill the Penguin for her, pick up all his abandoned loot, and be on her way. Fortunately for Lois, the hypnosis was eventually broken and the good guys saved the day. During the run of Superman’s Girl Friend Lois Lane, short stories appeared at the back of the issues that flashed back to other times in Lois’ life. One such story revealed that she and the future Superman had a connection years earlier -- when they were toddlers. The story, set primarily around the Lane family farm, revealed that even as a toddler, Lois was curious and getting herself into trouble. She went exploring in the woods, only to come across a deadly rattlesnake. Luckily for her, somewhere out in space, another toddler was also busy exploring. Kal-El, who would eventually become Clark Kent, and then Superman, was playing on his family spaceship with some of his father’s equipment. Thanks to a “space-warp” that sped up time and distance, a model rocket Kal-El ejected landed just near Lois with one of his own toys. The Kryptonian spinning rainbow twirler, which played music and projected light, scared the snake, and Lois was saved. 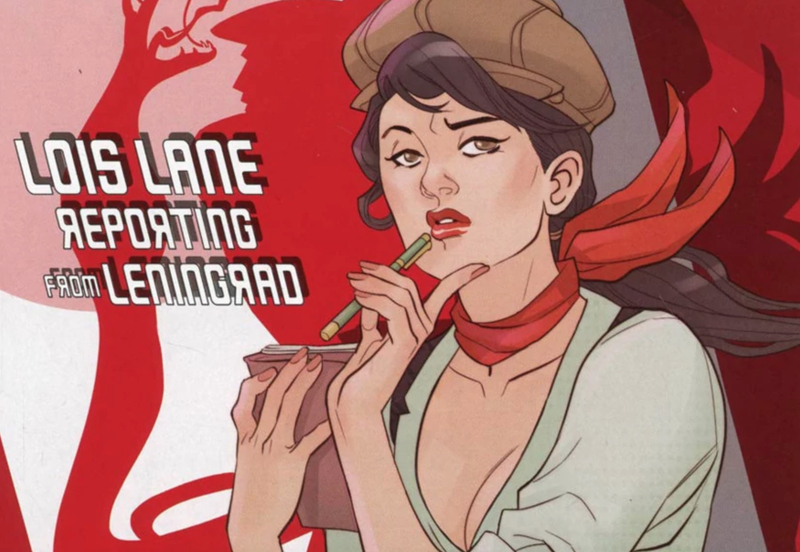 DC’s Bombshells reimagines the heroes and villains readers know in the age of pin-up girls and war machines. In this alternate universe, Lois is actually Eloisa Lane, a teenager of mixed heritage who sells newspapers to make ends meet. Living in the Cuban district of Metropolis, Lois ends up kidnapped when she makes her Bombshells debut, taken by a group of criminals working for Killer Frost. Luckily for Lois, she’s saved by the Batgirls, and she gets to go on one very big adventure. Lois, even though she’s one of the few without superhuman abilities, teams up with the Batgirls, Poison Ivy, Harley Quinn, Supergirl, and Zatanna to go up against Killer Frost and Hugo Strange. After helping to save the day, Lois even gets a job working at the Gotham Gazette, well on her way to becoming the star reporter readers know her as. If you thought Lois and Clark had their first meeting when Clark joined The Daily Planet, you’d only be half right. As teenagers, both Lois and Clark were selected as winners of a cub reporter contest by the paper that would eventually employ them both. Lois was introduced as a no-nonsense young woman out to chase a story -- only getting distracted by the possibility of Clark knowing Superboy since they were from the same hometown. The two are told that whichever one of them gets the biggest scoop will land a front page byline, but the teens also place their own wager with the winner getting ice cream from the loser. Lois set out to find a burglar on her own, ending up having to be helped out by Superboy, and getting the scoop. It began a long tradition of Lois scooping Clark while he tried to hide his identity from her all while helping insure her safety. With the various timelines and universes that exist within DC comics, more than 90 versions of Lois Lane have made it to print. In addition to the “Prime Earth” and “New Earth” versions of Lois that make up the most common continuities, there’s the Flashpoint version of Lois, there are criminal versions of Lois, Lois as the Red Tornado, the Green Lantern Lois, Lois that winds up married to Lex Luthor, a Lois that is killed by the Joker when trying to stop him, Bombshells Lois, and more. Even the live action versions of Lois Lane have been brought to the comics, creating more chapters of DC’s multiverse. Smallville’s version of Lois Lane got to see her story play out in a comic book that continued the events of the show and the DCEU has also featured comic book stories to tie in with the movies. 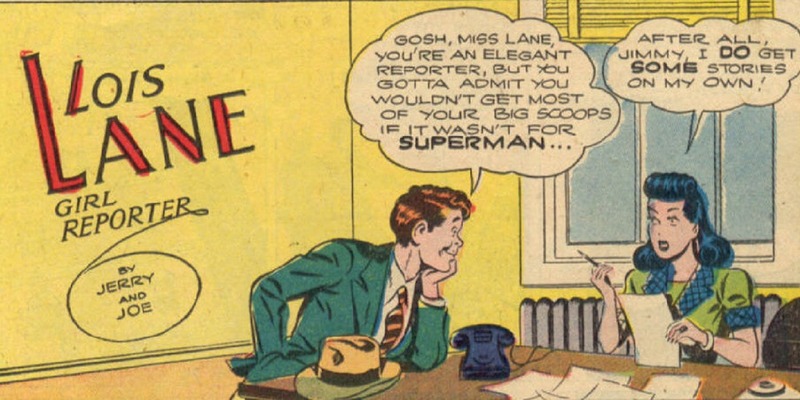 Before she was Superman’s girlfriend, Lois Lane was an impressive journalist in her own right. She worked her way up the ranks, taking on assignments other people thought were too dangerous in order to get the truth out to readers. She even won a coveted Pulitzer. Comic book readers don’t know what story earned Lois her Pulitzer, but she earned the prize in multiple universes and timelines on the page. In the movies, that’s another story. When Kate Bosworth was the Lois Lane to Brandon Routh’s Clark Kent in Superman Returns, the character also won a Pulitzer. Lois penned a piece called “Why The World Doesn’t Need Superman” prior to the events of the film, proving to citizens that they could be their own heroes. Just as any comic book character’s look changes with the passage of time, Lois has gone through quite a few styles over the years. Lois isn’t just influenced by the fashions of the decade, but also by the character’s appearance in other media. Each actress who has played the character has contributed to her appearance. As different women take on the role, for example, the character has been drawn with lighter or darker hair depending on the dominant media presence at the time. When Teri Hatcher played the character in the '90s, the character was drawn with short hair, and then again with long hair when Erica Durance took on the role. A violet shade for the eyes has also become the most common for Lois thanks to the artwork in the animated series of the ;90s. There’s no denying that Amy Adams, the most recent actress to take on Lois Lane in live action, is a terrific actress, but the version of Lois she’s been given to work with isn’t everyone’s favorite. Margot Kidder, who starred as Lois opposite Christopher Reeve in 1978’s Superman, thinks that the modern Lois isn’t the best. Kidder isn’t wrong either, as Lois hasn’t had a huge part to play in the current movies. This is partly due to scenes that actually prove her investigative prowess winding up on the cutting room floor, but that could change moving forward. There’s been talk of a Man of Steel sequel. Over the last few years both Marvel and DC comics have been making their way back into the Young Adult novel market with books featuring such popular characters as Black Widow, Spider-Man, Wonder Woman, and more. YA writers get to pen the novels with these characters, and in Lois Lane’s, readers are getting to see her in her high school days. Gwenda Bond has begun a series of novels dedicated to the character. So far, Bond has released Fallout, Double Down, and Triple Threat featuring the adventures of Lois. The series makes Lois the star instead of the usual Superman and features some of her first attempts at becoming a reporter as she sets out on investigations on her own. There are plenty of Easter eggs for fans of the Superman franchise, and Lois even meets someone familiar in an online role playing game that teases what the future might hold for her. One of the first female characters to appear in superhero comic books (and predating many eventual Justice League members), Lois Lane made her debut in the same issue as Superman -- Action Comics #1 in 1938 -- insuring that the two would always be linked. When Lois was first introduced, it was as a reporter for the Daily Star (which would become the Daily Planet), and she didn’t let anyone get in the way of her getting the best stories. Nearly 80 years later, she’s had her ups and downs, but she’s still one of the best investigators DC Comics has to offer. Originally, Lois was the daughter of a pair of farmers from Pittsdale, though that would eventually be retconned as her father was written as a career military man. It would be her father that taught Lois how to fight and shoot, giving her a hard edge amidst the softness of her crush on Superman. Since her debut, she’s died and come back to life a few times, she’s been a media mogul, a superhero, a super villain, and she’s been played by 30 actresses on the screen, radio, stage, and in video games. Did you learn something knew about Lois Lane? Did we miss an important fact that you think should be here? Let us know in the comments!